-has slept through the night 5+ nights now! -us talking to you! you smile so big! -books! you love your sophie "colors" book and will follow the pages with your eyes open so big! -you light up when your daddy gets home from work-it is absolutely adorable. -I've always thought moms were crazy when they said they cried a little bit when packing away their babies newborn clothes and now...I'm.that.mom. 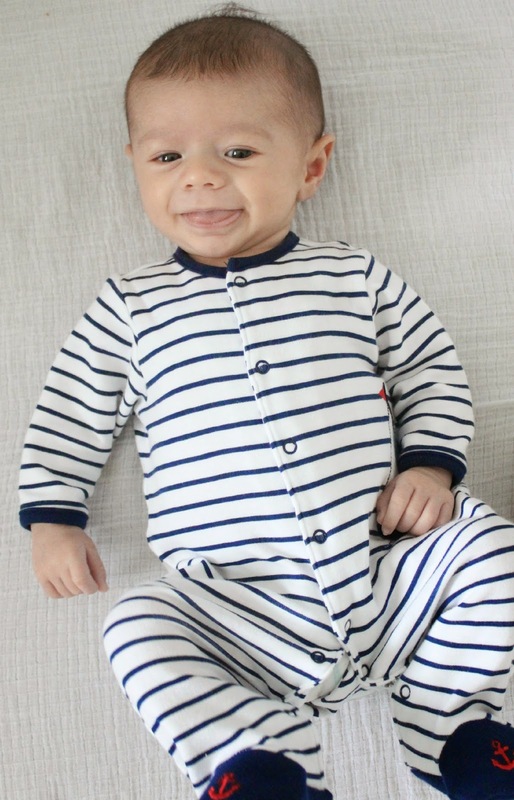 He is still actually in newborn sleepers, but has moved onto some 0-3 months clothes. He is so tall that it's hard to find pants that fit him around the waist AND are long enough (carters pants are like capris on him!) Anyone know places to buy pants for tall babies?! 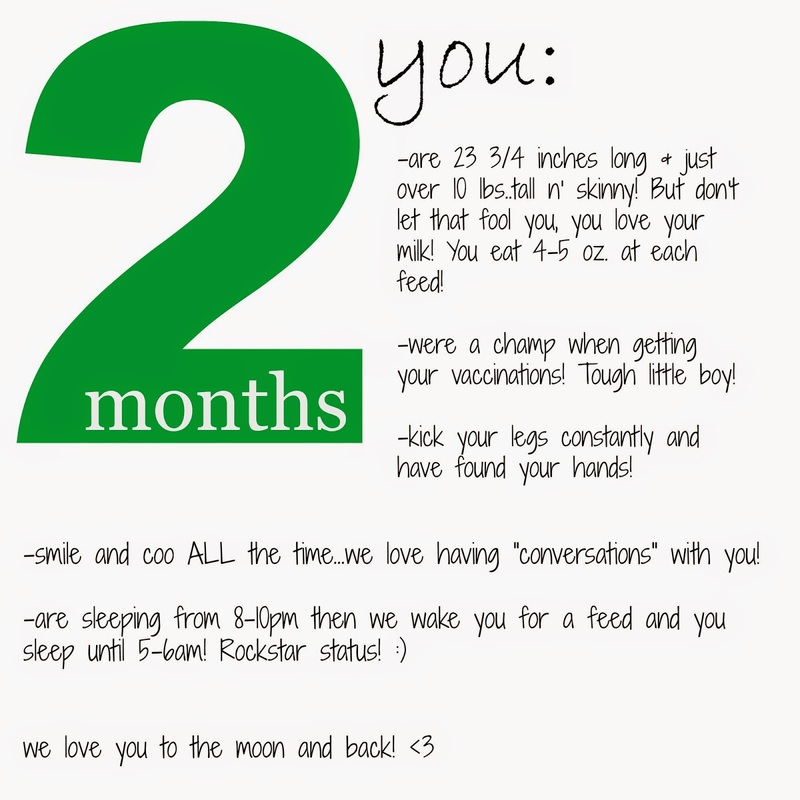 Cam has been such a happy baby this month. It seems like now that his reflux is under control, he's only fussy when he's really tired or hungry! Other than that, he smiles all the time and makes the best facial expressions. He has started doing this thing where he will stick out his bottom lip like he's pouting, but then will pull it back in and start smiling like he's tricking us! He will do it a couple times and it's absolutely hilarious! His breathing has gotten louder this month, which the ENT has told us can happen before it gets better and/or he grows out of it. Cam is an absolute joy to be around. My parents have been so helpful always willing to babysit and I'm so thankful because my stepmom (JuJu to her grandkids) will watch him whenever I want to go the gym because I can't bring him there until he's 3 months old. Rocky is still doing great with him...one of my favorite memories this month is when I'm rocking Cam in the glider in his room and Rocky will jump up and nap with him right on my lap! Excited for another new month of firsts with this boy! He's adorable! Try Children's Place for pants - if I remember correctly, they run longer! Try gap for the pants. And yay for him sleeping through the night! Enjoy it! I think that Target brand - Circo - fits rather longer than Carter's. Just remember - Carters' close shrink like crazy after you wash them so I ALWAYS go up in size when I buy their brand. And - I am so jealous with his sleep as we are 15mths in with our boy and he doesn't sleep through the night unless we medicate him. He's a cutie! 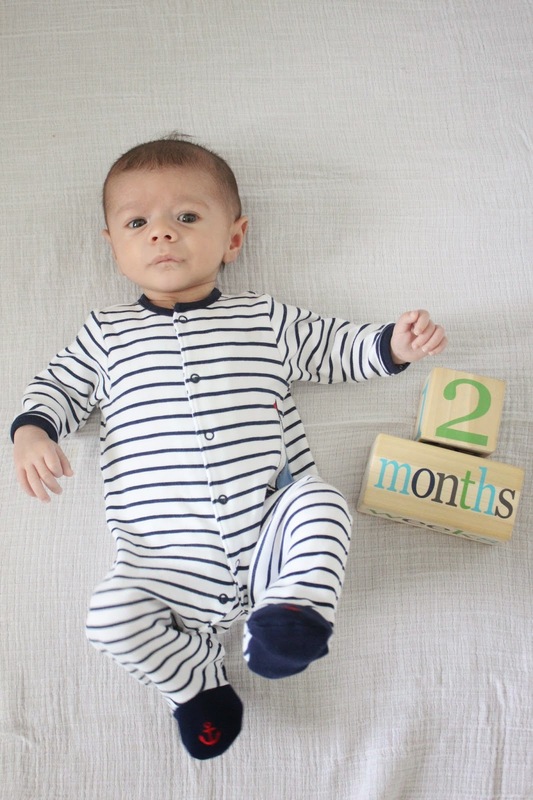 Can't believe he is already 2 months! My Cam has the opposite problem of big belly and thighs, short legs (lol). I've had to size up for pants and just roll the bottom. You may want to just size up for pants for him? Good for you for pumping! It's been so challenging for me, but as soon as I dropped that night time pump it got so much easier. I'm down to pumping 3 times a day now and it is so manageable! He's just adorable! For pants, I have a long daughter who is 3 months old. I've found that the different Carter's brands are all different lengths. The Carters Precious Firsts are the longest that I've found. Anything else is about two inches too short for her long legs!